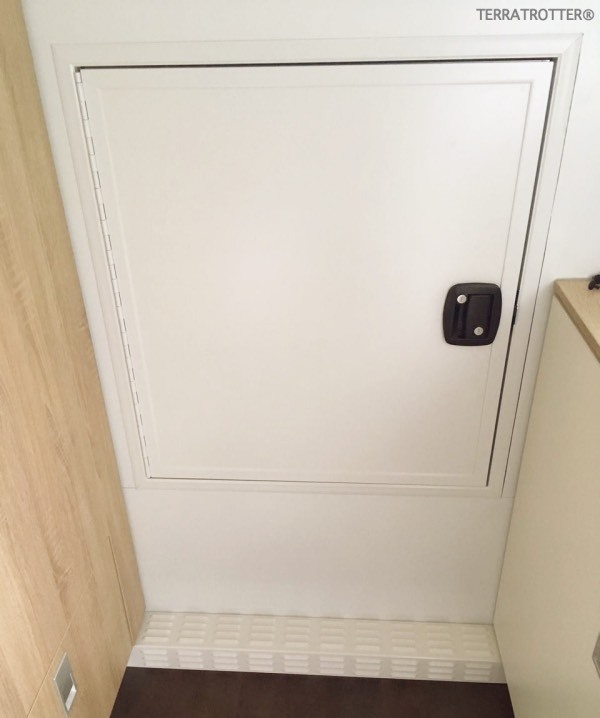 The pass-through, connecting the cab with the camper unit, is also known as the pass-thru, crawl-through, crawl-thru, walk-through, emergency hatch, … And even more variations exist in their size and construction. We decided very early that we really wanted one in our expedition truck. Not one to be only used in emergencies, but one we can comfortable use everyday . 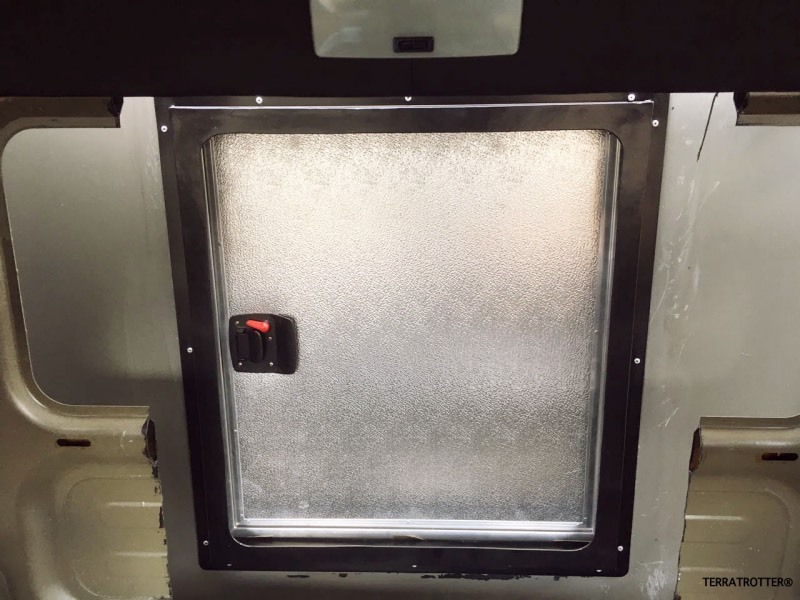 Why we installed a pass-through? we quickly want to put our groceries away. We already attract enough attention by parking our truck at the grocery store’s parking lot. 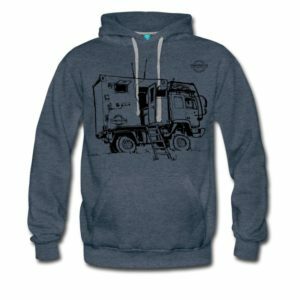 we no longer need to haul our valuables and snacks back and forth between the cab and camper. How did we construct our pass-trough? The Zeppelin-shelter – the base for our camper unit – came with two large rectangles openings on the side (where originally a heater was installed; see image on the right). 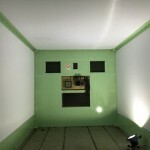 Since these rectangles were right above another we could easily make one big “square” opening from them; the perfect size for our pass-through. Out the backside of the cab we cut out the same size opening, which coincidentally had the maximum height possible for the cab. Only the window in the back of the cab had to go. So far, so good. For the doors it took a little longer to find a good and affordable solution. 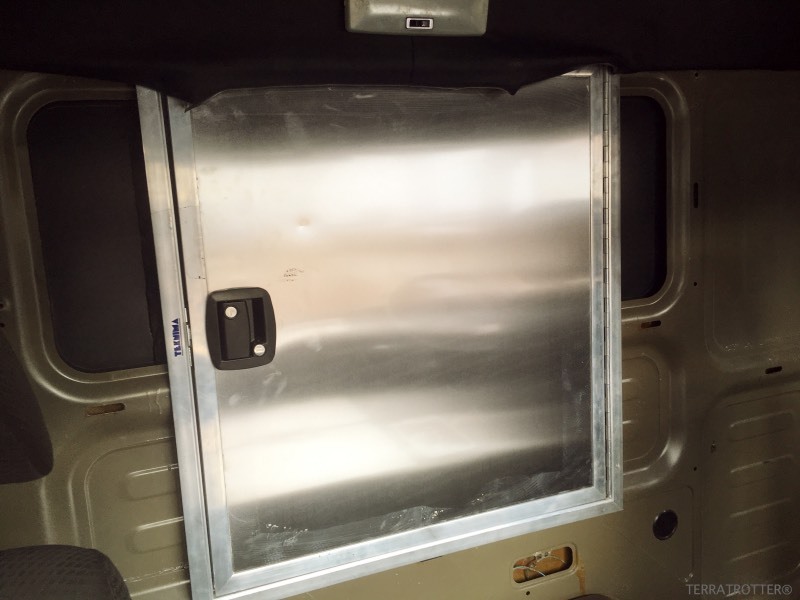 We eventually ordered custom-size aluminum hatches (doors) from a German company that normally builds these hatches for trailers. 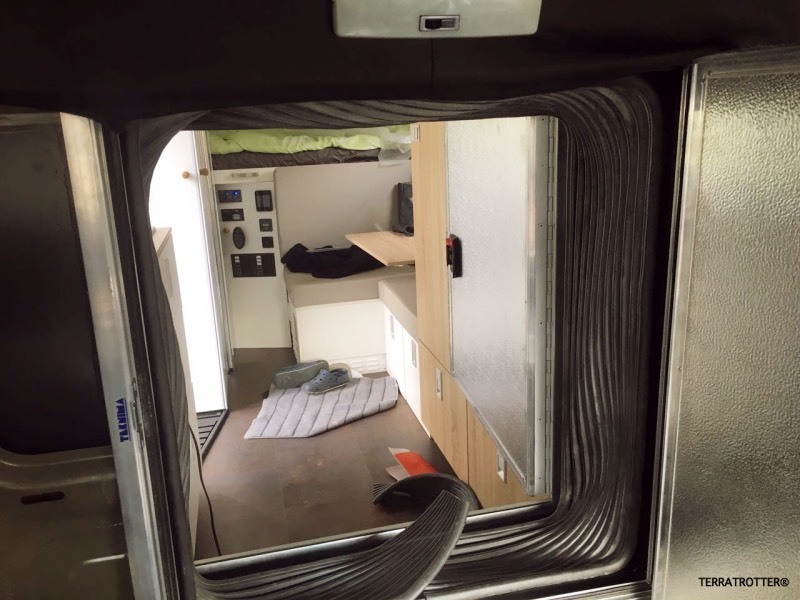 The only thing we still needed to do was to paint one side white to match the interior walls of the camper. Finally we bought 3 meter “accordion-rubber” (no clue how this is called; in German it’s called Faltbalg) to connect the 2 doors. 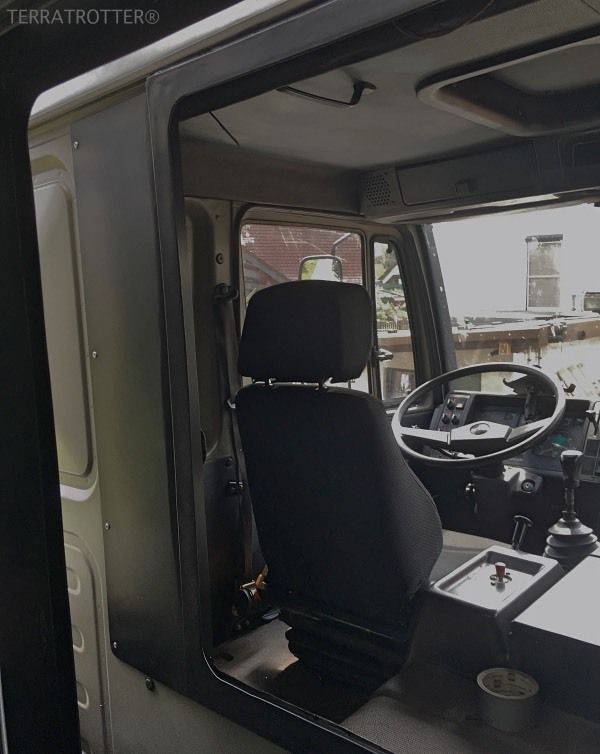 Since we can kip the cab forwards, we don’t want the rubber to be “permanently” attached with screws or bolts. Instead we had two frames made, based on the design from Videomundum (THANK YOU), around which the rubber is wrapped around. 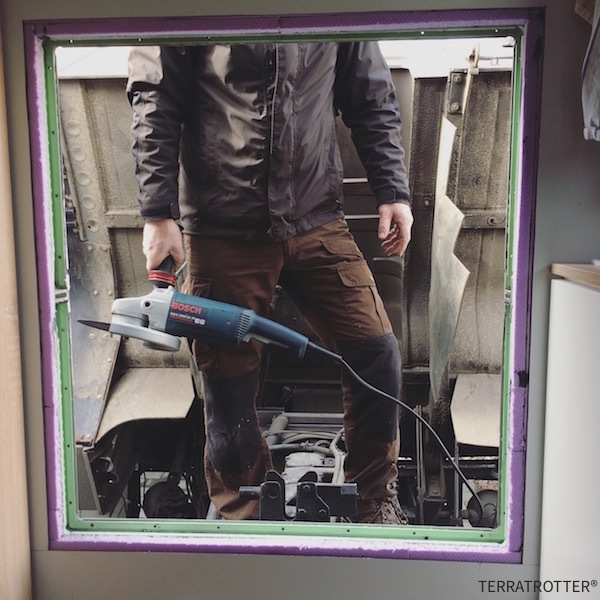 In addition, we extended the frame on the cab so it would also cover the holes from where once the window was. UPDATE: During our first day driving with our pass-through we already used +5 times. It’s definitely one of the best thing we installed! Be the first one to discover what we are up to by joining our family (free monthly newsletter; incl. access to our password-protected articles). What’s just plans and dreams for us, is reality for you. What are the dimensions of the pass-through? Do you leave it open while driving? The pass-through is approximate 70 x 80 cm. We don’t leave it open while driving, but we know people who do. Our door would block the view between driver and co-driver if we left them open. 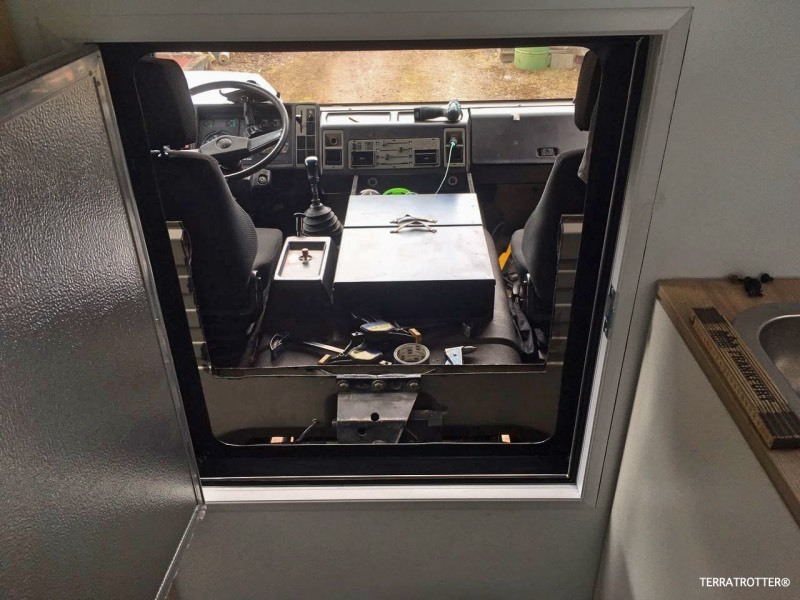 Do you have of a any means of closing the cab off if you have to either remove the camper or tip the cab in order to gain access to the engine? 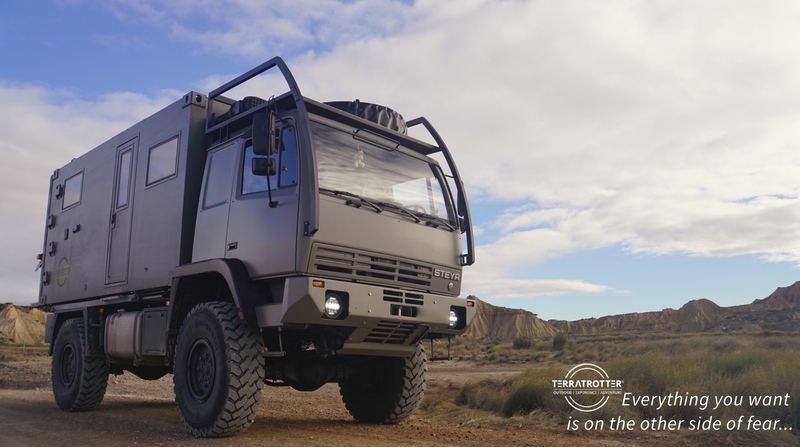 The pass through is an excellent addition and makes for a very quick setup and quick departure for one night stops. Yes. 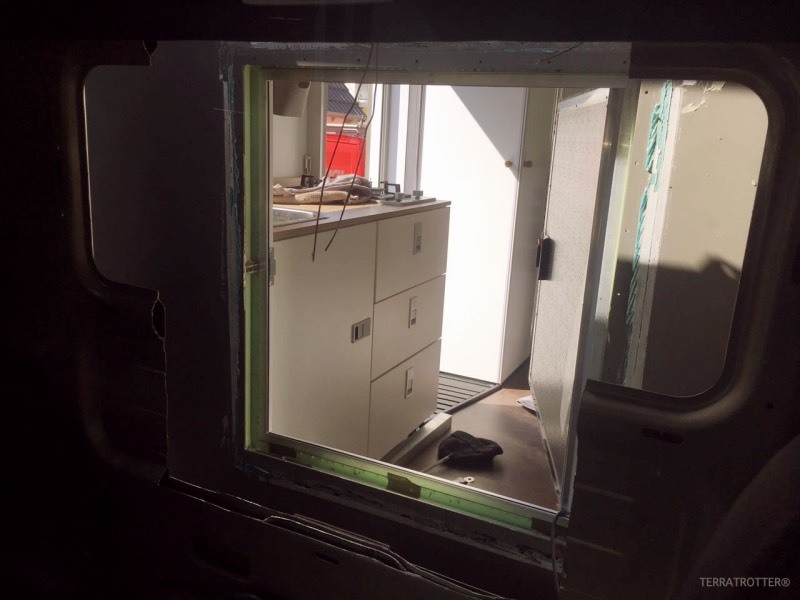 We installed doors (with locks) on both sides of the pass-through. Hope this answers your question. Can you tell me the name of the German company you used for the door and also the company who supplied the acording rubber?